A Muse Studio 2011 Holiday Catalog!!! Spiderwebs...Reindeers...Hearts...oh my!!! 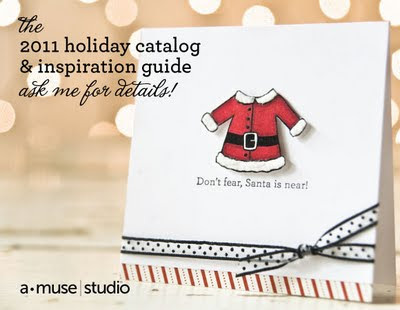 I was floored when I got a chance to peek at our new Holiday Catalog! You will be amazed at all the cute stuff we have in store for Halloween, Christmas, and Valentine's...oy! All the items along with the printed catalog will be available for purchase on August 22, 2011. But if you can't wait and want to take a peek inside the catalog, e-mail me and I will forward you a PDF right away! You will be speechless! Stay tuned for more exciting news about the upcoming 2011 A*Muse*A*Palooza! More fun and incentives for booking a workshop during that event!